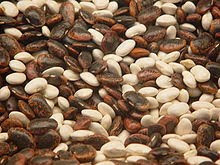 Dry beans, dry peas, sitsaro, mongo, patani and other legumes are rich in proteins. They have less quality protein content, but are cheaper than meat. Sometimes they are called foods that supply the body with incomplete proteins. Although they have less quality protein content, they can be served instead of meat. Foods containing quality protein such as milk, eggs and cheese may be served with them to supply the protein needs of the body. Good thing about these dry beans and dry peas is that you can store them in quantity so you can have steady supply. You can cook it in variety of recipes. You can boil it and sauté it with pork or shrimps or just eat boiled beans with fried fish and shrimp paste. Anyway you want it cooked it will bring you the needed proteins required by your body. There are other recipes that you can serve on luncheon using these meat substitutes like sauted mongo sprouts, sauted abitsuelas, boiled mongo and many more. I love these recipes especially sauted mongo sprouts and boiled/sauted mongo which can help you a lot when you want to shed some pounds. I'll post a recipe of my favorite mongo sprouts (togue) this week.